We have an amazing dinner meal using swordfish steaks for you! This Cracked Peppercorn & Garlic Swordfish Steaks with Avocado Butter and Sherry Mushroom Rice Recipe (whoa that is a mouthful, no pun intended), is so delicious that anytime we go grocery shopping and they have a sale on swordfish steaks, we have to stock up. For this recipe you will need either a Cast iron skillet or some other oven safe skillet in order to cook the swordfish steaks. In total it will take around 20-30 minutes from start to finish for this meal. A 6oz Swordfish steak for each person (this recipe serves about 4). ¾ cup (1 and ½ sticks) of butter. ½ Teaspoon of grated lemon peel (we use dried from the grocery store). About 1 Teaspoon ground peppercorns. 6 oz sliced Baby Portabella mushrooms. The juice of ½ a lemon. ¾ Cup Sherry cooking wine. Turn swordfish over gently and put skillet into oven, cook 10 mins. Before we get started, preheat your oven to 400° and set aside 1/4 cup (1/2 stick) of butter to soften for your avocado butter. The next thing you want to do is melt 1/4 cup of butter in a medium pan (not your oven safe/cast iron). Once the butter is melted, add in the 6 oz of Baby Portabella mushrooms. Cook until the mushrooms are tender, then add in the 3/4 cup of sherry cooking wine. Allow that to simmer down for around 10 minutes, stirring frequently. When the wine has cooked down, turn off the mushrooms and set aside until later. Begin boiling water to cook the rice. For this next part, add the 2 tablespoons of olive oil to the cast iron skillet and heat over mid-high heat for about 3 minutes. While the skillet is heating up, grind some salt and pepper on both sides of the swordfish steaks. Once the skillet is nice and hot, add the swordfish steaks and sear for 3 minutes. If your rice cooks in 20 minutes, start cooking it during the 3 minutes. When the 3 minutes are up, turn the swordfish steaks over gently and slide into the oven for 10 minutes. While you are waiting for the Swordfish steaks and rice to cook, take your avocado and dice it up. Add the diced avocado to a bowl with the juice of half a lemon, ¼ cup of softened butter (½ a stick), and the ½ teaspoon of garlic salt. Using a fork, mash and mix until the avocado butter is smooth and creamy. When you have about a minute left, turn the mushrooms on again just to warm them back up a little bit. If the rice is done, add the sherry mushrooms into the rice and stir around. Cover it until you are ready to serve. Almost time to eat!! Plate the swordfish steak and spoon the garlic butter sauce that you made in the cast iron over it. Serve with the sherry mushroom rice and the avocado butter on the side. I like to put the avocado butter on top of my rice and swordfish steak. Liz likes to have the avocado butter on the sherry mushroom rice and a dollop (yeah, I said dollop) on the side to dip the swordfish in. Either way it tastes amazing. 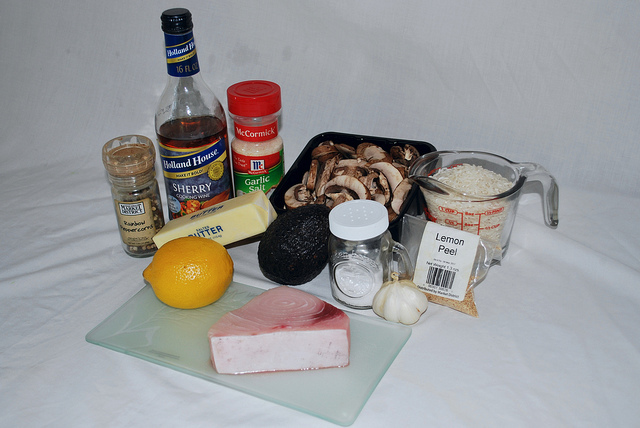 What is your favorite way to cook swordfish steaks? Leave a comment bellow and tell us about it. Tagged Avocado, cast iron, Dinner, dinner ideas, food, Garlic, Swordfish, SwordFish Steaks. Bookmark the permalink.